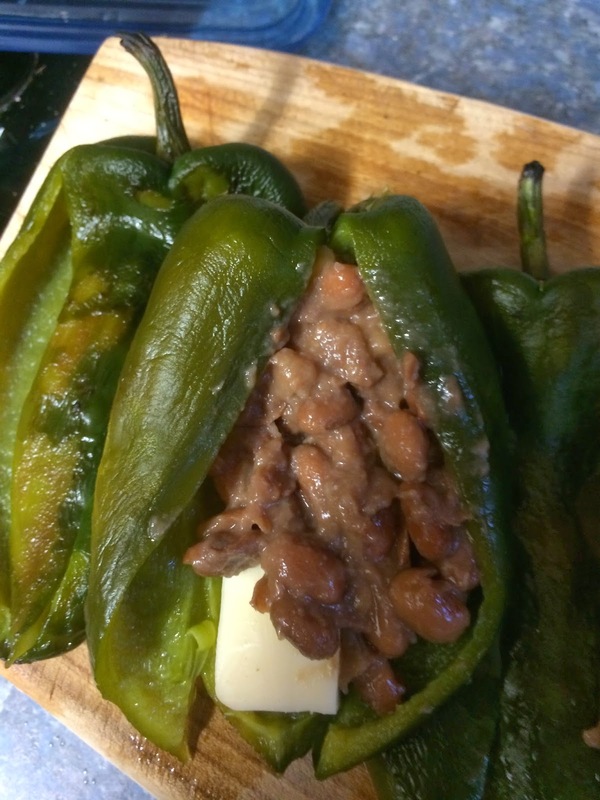 Some of my early viewers have expressed interest on cooking Chiles Rellenos...BUT... they want to know how to cook canned beans (I cook them from scratch, which I will post later). Obviously in a contemporary world people don't have the time to be in the kitchen all day (somehow seems that I do) and they resource sometimes to some canned products. This is a very easy recipe to do and the final product will taste almost as good as the home made. Promise. 2. In a medium size casserole we are going to sauté the sliced onions and the garlic until the onion becomes a bit translucent. You can add a bit of rosemary here. 4. Add the 1/2 Tsp of cumin and stir. 6. Cover the casserole, lower the heat to simmer and let it cook for 20 minutes. 7. 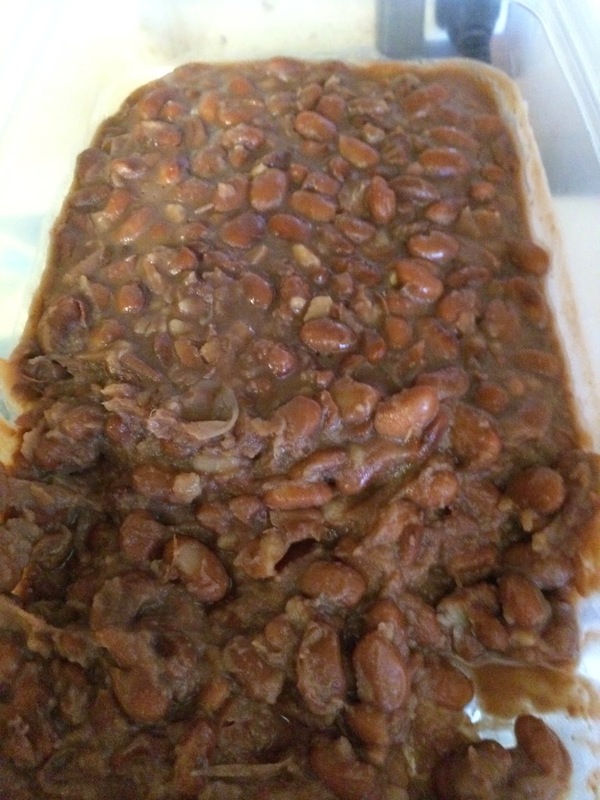 Now we are going to give the beans some texture: with a kitchen masher mash some of the beans so the clear bean liquid becomes a bit more dense. Stir until you get the texture. 5. Incorporate to the mix the dry ingredients (do it in3 batches) and then add the egg, the peanut butter and the bourbon until it becomes one even mix. 6. Add the chopped bacon (the 3/4 cup) and the 2 tablespoons of bacon fat. Reserve. 9. With 1 tablespoon of batter we are going to form a ball. Place the ball in the baking tray and repeat until you finish the batter. 11. Put in the oven and bake for around 10 minutes or when you see the edges browning a bit. Repeat for the two trays. 12. IMPORTANT!. Let cook the cookies IN THE BAKING PAN for 5 minutes or so because we need them to be a bit stiff, otherwise they will brake into pieces. 13. Once the cookies are cold enough to move them without breaking, transfer them to a wire rack to cool completely. 14. Let’s do the last part. Now in a heatproof bowl over a sauce pan with water we are going to melt the chocolate until smooth. It will take you from 5 to 10 minutes. When smooth, remove from the heat (just make sure that the water doesn’t touch the chocolate). 15. Distribute the 1/4 of bacon bits on top of the cookies (just a couple of bits per cookie) and drizzle with a fork the melted chocolate. Allow it to cool 100% (two hours). Thank you for visiting my blog. It took me some time for me to decide to do it, but finally I stopped procrastinating and here you are. I decided to start this blog with one of my favorite recipes of all times!. 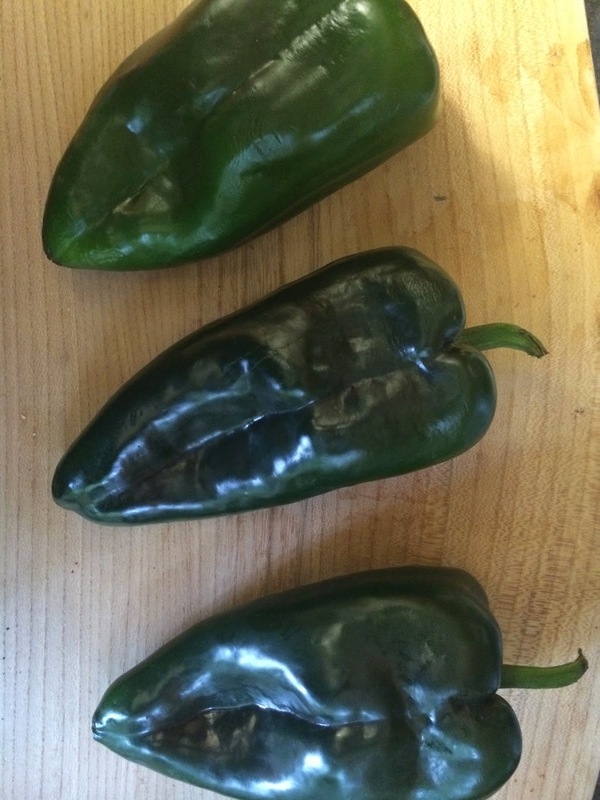 I really like the poblano peppers because they are so versatile, I cook them in so many different ways -stuffed with ground meat, chicken, tuna, plantain...you name it-. This dish has been prepared since the mid 1600's. Chiles rellenos represent the fusion between Mexican First Nations and the Spaniards. As you know peppers were a big part of the Mexican and Central American people, more so...they were one of the three main ingredients in their diet along with corn and beans. Later on I will post another more Summer like recipe I do: Chiles rellenos with guacamole and pomegranate. It is out of this world good! The only recipe I have never tried is the famous Chiles en Nogada. I do have a fantastic recipe, but it is complicated and time consuming... but I am decided I will do it this year, probably in September (the traditional month for this recipe). - Once the BBQ is warm, put the peppers on the grill and close the lid. 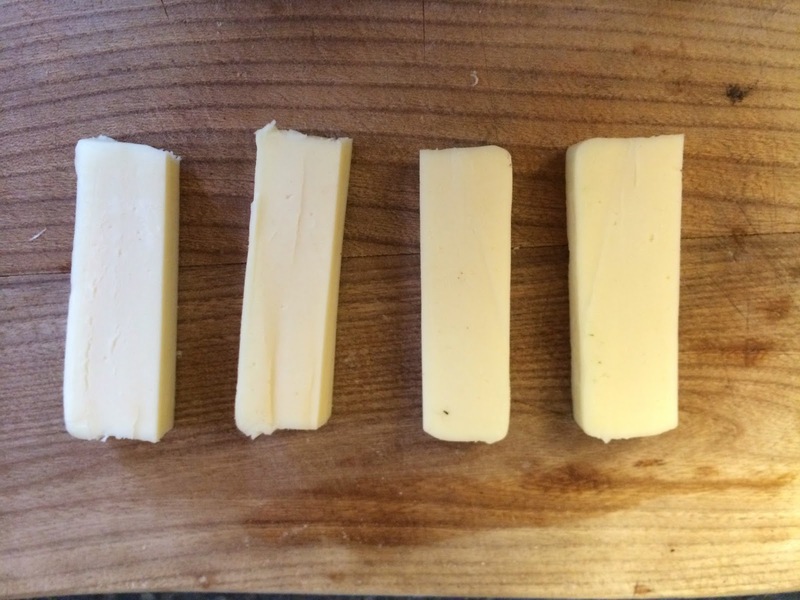 Wait for about 3 minutes, open the lid and turn them around. You will see that the skin has blackened a bit and it has lots of blisters. That is what we want. Wait for another 3 minutes, lid closed. If you are doing it on the stove, turn the fire to high heat and place the peppers directly on the fire, turning them every minute or so until the whole pepper is blistered. - By now the peppers should be blistered and a bit blackened -NOT BURNED!!-. Remove and put them in a plastic bag (using tongs) and close the bag. They will sweat. Leave them there for a while. 2.In a medium pan, warm up the canola oil and sauté the onions. Incorporate the stewed tomatoes and stir at medium heat for 10 minutes. 3. Remove the mix of tomatoes and onions and blend them. Bring them back to the pan and keep the heat on medium. Add the Knorr cube -or your brand of concentrated beef stock- and stir until dissolved. Keep stirring for 10 minutes and put the lid, lowering the heat to the simmering setting. We are going to keep it like this for 20 minutes and then turn off the heat. Reserve. cold water remove CAREFULLY the skin. We don’t want to tear the pepper’s flesh. 5. 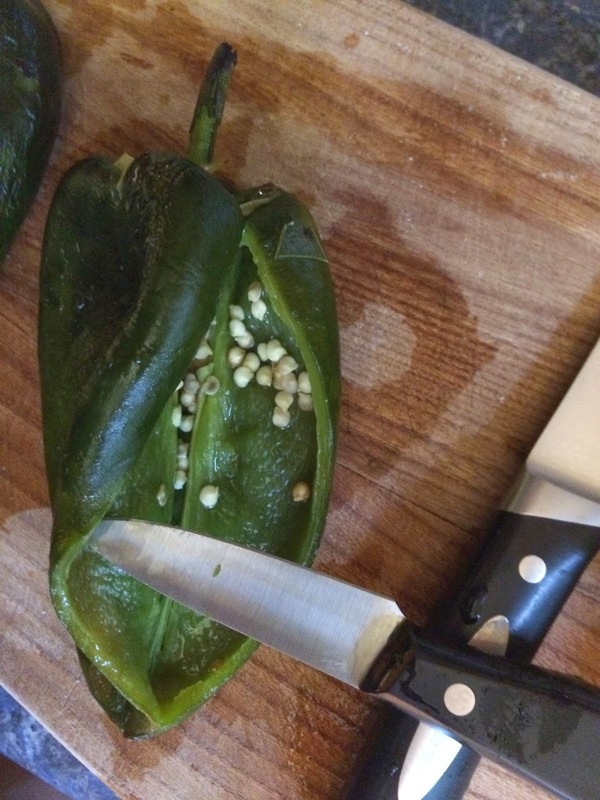 Once you have the peppers skinless, with a small knife open each pepper lengthwise. Carefully remove the seeds and reserve. 6. Now we are going to stuff the peppers. 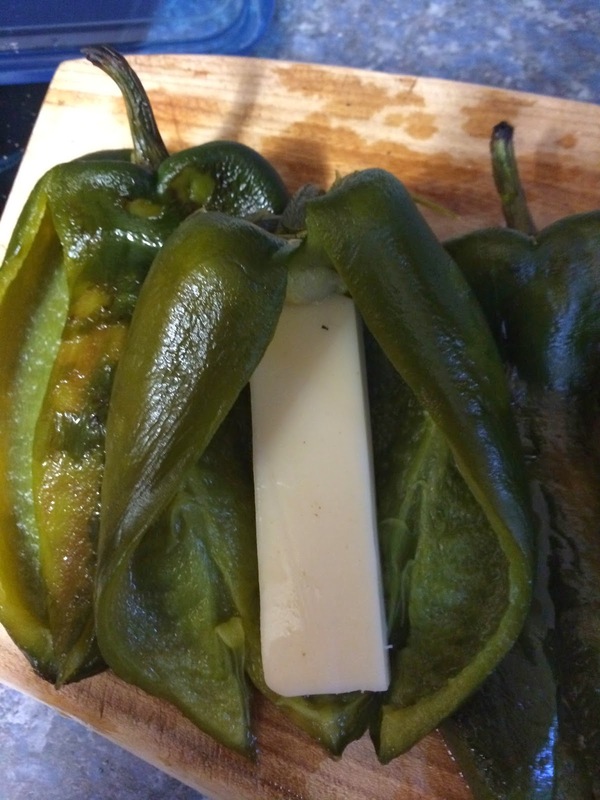 Take one cheese piece and place it inside the pepper. 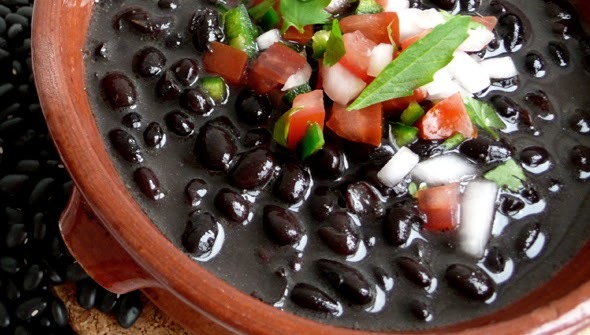 Add two full spoons of beans and carefully close the pepper. Repeat for all peppers and reserve. 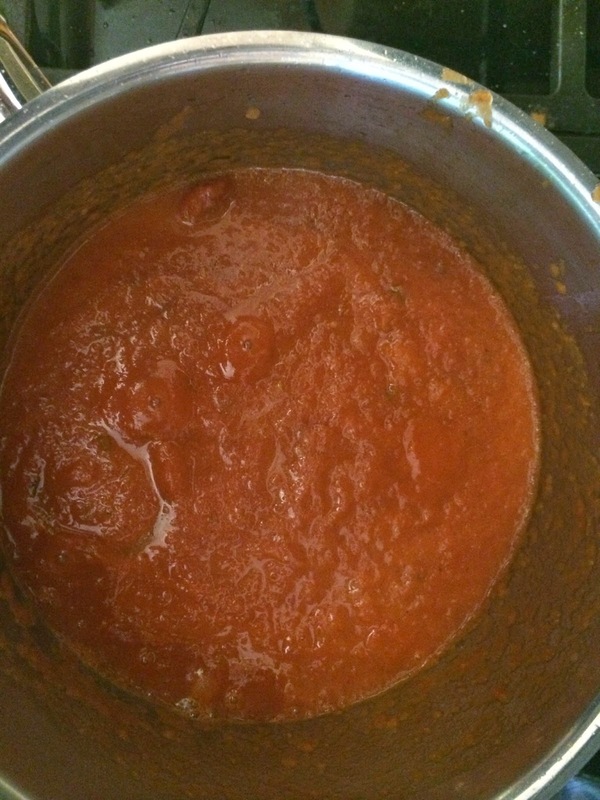 tomato sauce we have prepared. Turn the heat to medium-low. Put the lid and let them warm up for another 20 minutes. 8. Once the cheese has melted we know that our peppers are ready. 9. 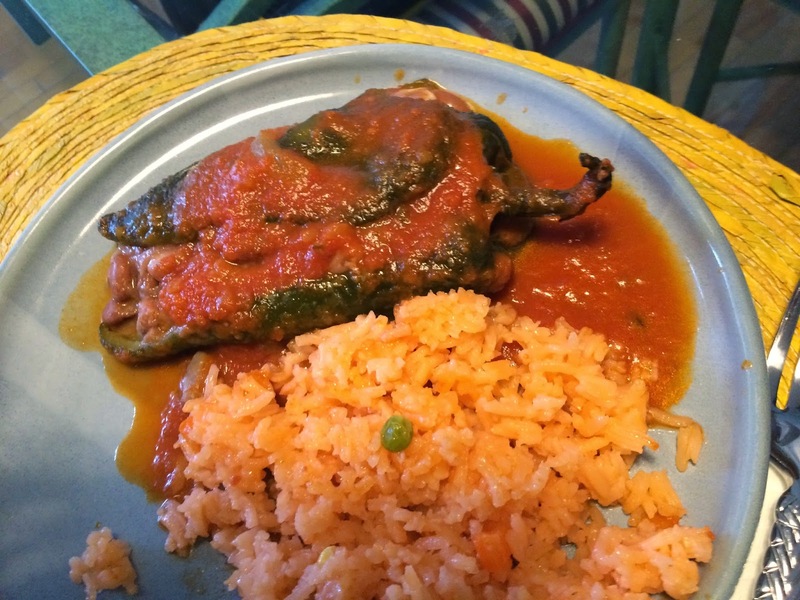 Usually what I do is serve one chile relleno with Mexican style rice and sauce and accompany the dish with warm and delicious corn tortillas.